This is an all-in-one Rejuvenating Facial Set is your partner to achieve a lighter and younger looking skin. It is expertly formulated to be a combination of gentle yet effective looking products that is suitable for acne prone skin. Rejuvenating Soap. Rejuvenating Facial Toner Number 1. Rejuvenating Facial Cream Number 1. (2)wash face with beauche bar soap. toners can neutralize any remaining traces of a cleaning lotion. UV rays or high temperatures. CLARIFYING LOTION- a deep cleansing agent. it has vitamin A and has tightening effect on your face. This can result in an anti-aging effect on the skin. Rejuvenating Facial Toner: used to dry up oil, tighten pores, and prevent blemishes from forming. One (1) SIX PIECE BEAUCHE INTERNATIONAL BEAUTY SET. -One Beauche Age Eraser Cream 10 grams. -One Beauche Skin Toner Solution 60 ml. -One Beauche Exfoliating Cream 10 grams. -One Beauche Rejuvenating Cream 10 grams. Create plump, firmness and glow to skin. Glow Lift Lotion Toner 30ml x 1pc. Facial Wash 20ml x 1pc. Glow Lift Gel 10ml x 1pc. SET CONSIST OF Makeup Remover Cleansing Cream 15ml x 1pc. Rejuvenating Set No.1. Extra Strength Rejuvenating Soap 150g. Rejuvenating Facial Toner No.1 60mL. Rejuvenating Cream No.1 10g. Cleanse face with rejuvenating soap. Rinse well and pat dry with soft cloth. Ultimune Power Infusing Concentrate, 0.34 oz. Ultimune Eye Power Infusing Eye Concentrate, 0.18 oz. White Lucent MultiBright Night Cream, 10 ml. Set contains;. Ultimune Power Infusing Concentrate, 0.34 oz. Benefiance WrinkleResist24 Intensive Eye Contour Cream, 0.17 oz. Set contains;. Burt's Bees The Natural Edit Gift Set. Made with natural ingredients. You can use the cards over and over since you use them with the Dry Erase Markers. The markers have Mary Kay on them. You will get 3 sets! After using Brilliant Skin Rejuvenating Facial Toner, gentlyapply Brilliant Skin Rejuvenating Cream evenly on your face andneck with upward motion. Rejuvenating Facial Set. This is all-in-one Rejuvenating Facial is your partner to achieve a whiter and younger looking skin. 1▪Refreshing toner▪5Fl. Oz.Full Size. 1▪Cleansing Gel▪4.5 oz Full Size. We are not affiliated with, nor endorsed by Mary Kay Inc. We liquidate products from prior consultants. Most of Mary Kay products are not factory sealed. Dr. Alvin All-in-1 Maintenance Set. This set must be use after the Kojic Acid Facial Set By Dr. Alvin. This will relax the skin after the exfoliation from the Rejuvenating Set. Use for a month and experience your skin changing to a smoother brighter you. BEAUCHE CLARIFYING SOLUTION. 60 ML EACH. Mary Kay SatinHands Peach Satin Smoothie Hand Scrub▪Full Size 7.75 Oz. Striped Clinique bag with logo. Cream Shave, 30ml. Face Scrub, 15ml. Face Wash, 30ml. Christian Dior Diorsnow Gift Set. Cream Dior Beauty Bag contains. It Leaves a fr esh, gentle and feminine fragrance with notes of rose, jasmine and gardenia. 3ml - Lierac Hydragenist Hydra-Smoothing Eye Gel is an eye contour gel which allows hydration from the morning and acts on the puffiness and dark circles. CLINIQUE, votre alliée n°1 dans la lutte contre les signes de l’âge. Elizabeth Arden Skin Essentials Eight Hour Cream Set Hands Lips Face Cream. Condition is New, opened box.. Shipped with USPS First Class Package. Satin Smoothie Hand Scrub -7.75 oz. Hand Cream - 3 oz. Instruction Pamphlet. Benefiance WrinkleResist24 Balancing Softener Enriched (0.85 oz.). Benefiance WrinkleResist24 Night Cream (0.33 oz.). Benefiance Extra Creamy Cleansing Foam (1 oz.). Ultimune Power Infusing Concentrate Serum (0.33 oz.). After cleansing and toning, apply an ample amount of Brilliant AHA Serum all over your desired area then blend lightly and quickly. Use twice daily. Apply Brilliant Skin sunscreen 30 minutes before sun-exposure and re-apply as needed. Mary Kay SatinHands Fragrance Free Satin Smoothie Hand Scrub▪Full Size 7.75 Oz. Shiseido Pureness Mosturisong Gel-Cream 40ml. (2)wash face with beauche bar soap. toners can neutralize any remaining traces of a cleaning lotion. UV rays or high temperatures. AGE ERASER CREAM- gives a natural pink glow effect on your face, makes you look younger, healthier and fresher. Green Tea Balancing Skin 25ml - Nourishes skin effectively while leaving a smooth refreshing feeling. Green Tea Balancing Lotion 25ml - Penetrates deep into the skin instantly while balancing skin's sebum secretion. The following Solutions by Hive products are included Purifying Cleanser 190ml. Purifying Toner 190ml. Dr. Alvin Rejuvenating Set. and protect your face from your blemish problems. 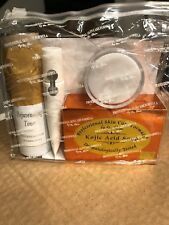 The set includes a Kojic Acid Soap, Rejuvenating Facial Toner. Rejuvenating Cream, and Sunblock Cream. These products will not only help dry up and heal your acne fast. This Kit includes Age smart Skin Resurfacing Cleanser 15ml/0.5fl.oz. Age smart Overnight Repair Serum 5ml/0.17fl.oz.